In South Asia, more than 5,000 people are dead, and the toll seems to rise daily. Parts of an historic city center — the hub of daily life for thousands of people — have been reduced to piles of rubble. In Kathmandu and the surrounding region, people are without food. Words cannot do justice to such an insurmountable tragedy. The only antidote to this type of loss is resilience. Like others around the world, I have read of the horrific destruction caused by the recent massive earthquake that struck Nepal, its epicenter near the capital city of Kathmandu. The first reaction is shock, especially when the numbers truly sink in. Five thousand. As of Wednesday, the death toll is equal to the populations of entire Chicago suburbs, from Willow Springs to Northfield. The next reaction is to think of the recovery. What we are now seeing is people coming together to clean up the massive amounts of debris and pay respect to the people who were lost. As I’ve read the news, the stories from locals reacting to the human toll have been heartbreaking. But I’ve also been struck by the comments about the loss of buildings and landmarks. The New York Times, meanwhile, ran before-and-after photos of the historic sites that were leveled. Seeing these images side by side, it’s easy to understand why people are grieving. These places are beyond beautiful, beyond inspiring. They have untold amounts of cultural and historical meaning. Nepal’s cities, especially Kathmandu, have survived centuries. These places are not just world treasures — some are UNESCO World Heritage sites — they are also homes, centers of civic activity and places of business. The connection to these places is so deep among the Nepali people that they are being mourned as if they were flesh and blood. It has made me think about our own neighborhood and how our residents would respond to such tragedy in our own backyard. The ties people have to our neighborhood are strong. Many people were born and raised here, while others like myself moved here specifically because of the attachment that people develop to the community. I have no doubt that we would grieve for both the loss of lives and livelihoods. And I have no doubt our residents would be on the streets immediately sifting through the rubble. Our neighborhood has many special places. Our religious institutions and schools, for instance, help make up the backbone of our community, and the fact that they are situated within our neighborhoods — next to and across from our homes — rather than on the fringes is indicative of their importance. Many of the structures that house these institutions are among the most historically significant in our community. If we lost those, I am positive the rebuilding efforts would begin immediately, because we couldn’t bear to be without them. We also have historic landmark districts full of homes that represent high standards of residential design. We have train stations that are so unique they look as if they were flown into Chicago from a small town in the country. These are places I can’t imagine our neighborhood without. It would be less beautiful. 103rd Street is increasingly becoming a more memorable public space. Image from Google Streetview. Click to explore. Still, many streets that make up our public realm, the areas where we simply walk to the store, ride our bikes to work, wait for the bus or meet friends on the way to a restaurant, are not in the kind of state where a person could do any of the aforementioned activities pleasantly (or safely). Yes, we find friendly faces in the shops. We find people who take pride in their customers and businesses, sprucing up their storefronts to make them as welcoming as possible. We find customers who are happy to shop somewhere they know the person behind the counter. But on the street and sidewalk, the space that is framed and shaped by the built environment around it, a memorable sense of place is more difficult to come by. Shouldn’t these locations inspire in the same way as our churches, schools and tree-lined residential streets? Many of our major corridors might be near the edge of the city proper, but they also represent the heart of our neighborhood. Is a street like Western Avenue a place that instills the same kind of deep connection in our residents as the historic center of Kathmandu instills in its? If it were destroyed, would we rebuild the acres of strip malls? Would we pave over our land and re-establish our parking lots? Would we widen our street so future generations could drive at higher speeds and zip through our neighborhood a few minutes more quickly? Or would we take a different approach? Would we enhance our public realm to ensure we had a place that could foster street life? Would we make the focus on the people? Would we construct a place that reflected our values of family and community? This isn’t the first time I’ve pondered this topic. During school lessons about World War II, I read about the near total destruction of Warsaw’s Old Town and how after the war, the city center was rebuilt according to its original plan. It made me think about how the people of Warsaw had such a deep love for their city that even the devastation of war could not keep their beloved civic spaces from becoming mere memories. A few years ago, my wife (then my girlfriend) and I visited relatives in the German city of Cologne, a place where major portions of the urban landscape were also obliterated during World War II. Yet the people rebuilt. Scars from the war might have remained emotionally, but the people could still take pride in walking through an intact city that met their daily needs. They shaped their public spaces through traditional neighborhood design, building places for people to stroll, congregate and live rather than distributing people in a far-flung, suburban fashion and further eroding the community cohesion their city fostered for centuries. Closer to home, the people of New Orleans similarly mourned the loss of some of their neighborhoods after Hurricane Katrina. In that city, where my wife and I honeymooned, the people did not lose their city center, nor their popular tourist attractions like the French Quarter or the Garden District. They lost neighborhoods of housing for the poor and working-class. They mourned places made up of vernacular, but no less historic, architecture like shotgun-style houses and corner stores. This, too, is a public realm for which people carried strong emotions. In the years since, the conversation has largely been about rebuilding New Orleans’ neighborhoods in a similar fashion while continuing to strengthen the places that may have not shaped the public realm in such a positive way. There is an acknowledgement that what is to be rebuilt is not simply houses but rather a space that fosters feelings of community pride. For contrast, we can look at a city like Xenia in southwestern Ohio, a place my wife and I passed through last year. In 1974, a tornado destroyed a large chunk of the city’s historic downtown and nearby neighborhoods. A visit to Xenia reveals that this is a place that locals have long loved. The 1974 tornado — and subsequent ones in 1989 — did not destroy some buildings like the historic courthouse, city hall, Collier Chapel and numerous mixed-use buildings in the downtown, and their timeless architecture, along with the way they shape the public realm, indicate decades of civic pride. The damaged areas, however, were rebuilt in a typical, nondescript suburban fashion, and the juxtaposition of the traditional buildings with the auto-oriented strip malls is jarring. The anchor spaces in the strip mall are occupied by Kmart and Family Dollar, both of which make use of a large street-facing parking lot that, judging by photos, struggle to be even half-full. On the periphery of this parking lot are drive-thru banks and fast-food establishments, sending the message that downtown is not a place where you stay — it’s a place you pass through, maybe getting out of your car long enough to walk from the first couple rows of parking to the Kmart. At least that’s the message it would send if the adjacent properties looked the same. While it seems vacancies appear to be an issue, it looks as if this is a type of built environment the city is looking to enhance. These areas are largely welcoming, with sidewalk seating, trees and, most importantly, people. The structures create a sense of place and a built environment that is adaptable to different uses. It’s the kind of place I would mourn if it, too, were destroyed, for I know what would likely appear in the aftermath: A strip mall, a parking lot and a plaque commemorating who and what were lost. 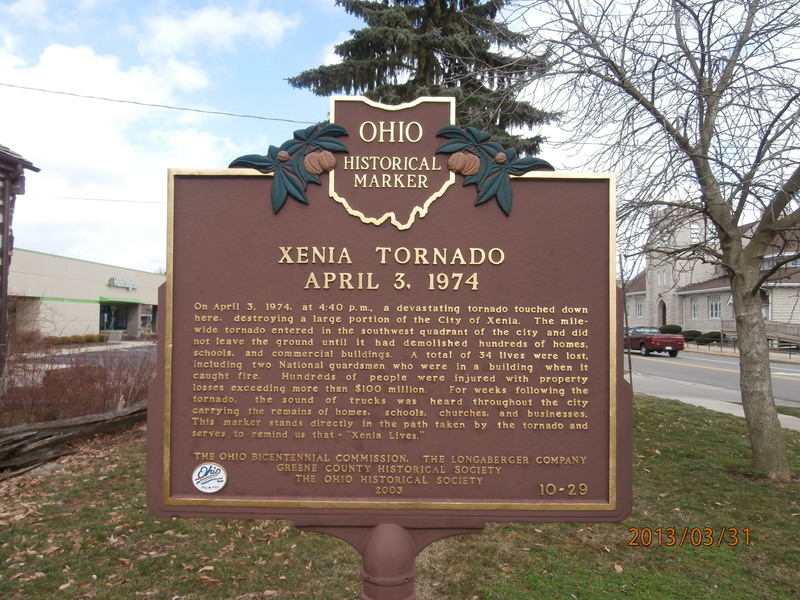 “Xenia Tornado Marker” by Gbauer8946 – Own work. Licensed under CC BY-SA 3.0 via Wikimedia Commons. Blocks of historic city fabric are now a parking lot. Image from Google Streetview. Click to explore. So I ask: Do we have a public realm that we would be inspired rebuild to the exact detail of what was destroyed? If not, what would replace it if it were lost? Would these new places be as beloved as the last? How can we ensure that any new places we create reflect the values of our community and inspire generations upon generations of esteem and affection? If the value of a community is in its people, then surely the way those people shape their environment will determine the community’s legacy. The public realm knits people together. It is a visual expression of our shared history and principles. It tells us where we’ve been and what we want our future to be. It should be beautiful. It should be worth rebuilding.